If the good weather holds out, let's spend a day in the Lazio countryside in the town of Palestrina (if it doesn't we'll reschedule!). About 40 minutes outside Rome, Palestrina is famous for the archaeological museum built onto the remains of a massive temple. 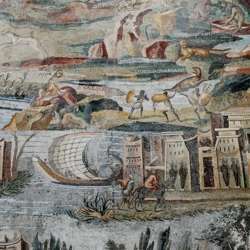 Inside the museum is the famous 1st century BC mosaic depicting the Nile River, and showing the Roman fascination with Egypt. Buses run to and from Rome regularly on a Saturday. We shall aim to take the quickest one at 10.20, though if you arrived at another time, you can call us and meet up with us in the town.